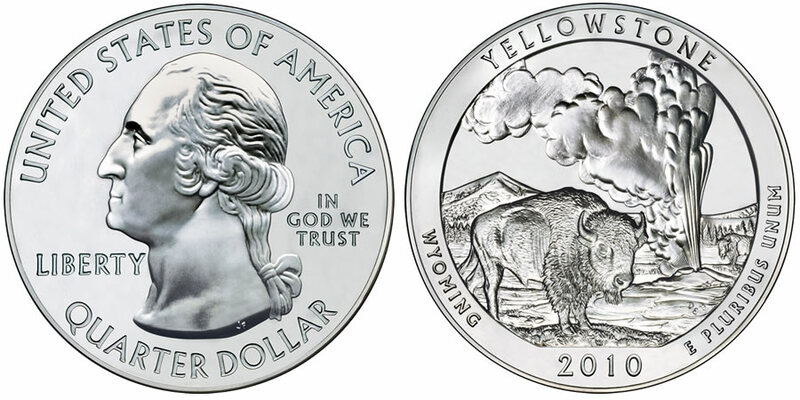 The 2010 Yellowstone Silver Uncirculated Coin is the second of five 2010-dated strikes by the Mint to be struck for collectors from five ounces of .999 fine silver. This specific coin honors Yellowstone National Park found mostly in the state of Wyoming. Yellowstone was first created as a national park on March 1, 1872 by an Act of Congress signed by President Ulysses S. Grant. It marked the first time, not only in the United States but also the world, that a national park was created for the protection of the resources found there and the enjoyment of its lands by future generations. The national park is massively large at 3,472 square miles and is known the world over for its scenery, its wildlife and, of course, its thermal features. The most popular of these among visitors would have to be Old Faithful Geyser, which erupts at regular intervals allowing for prime viewing by all who stop. The five ounce uncirculated coin series, of which this strike is a part of, are the collector grade versions of the US Mint's America the Beautiful Silver Bullion Coin™ Program. In addition, both feature obverse and reverse imagery similar to that found on the Mint's America the Beautiful Quarters® Program which is not entirely surprising as the bullion coins were authorized by the same legislation that created the quarters. Each five ounce uncirculated coin contains a P mintmark indicating it was struck at the US Mint's facility in Philadelphia. The bullion coins contain no mintmark. An image of George Washington, the first President of the United States, is surrounded by the inscriptions of "UNITED STATES OF AMERICA," " LIBERTY," "IN GOD WE TRUST" and "QUARTER DOLLAR." The portrait of the former President was designed by John Flanagan for the 1932 circulating quarter dollar. The inscriptions of "YELLOWSTONE," "WYOMING," "E PLURIBUS UNUM" and "2010" are shown on the reverse surrounding a design of Old Faithful Geyser erupting with two American Bison flanking it. The design was completed by Don Everhart. ".999 FINE SILVER 5.0 OUNCE" is shown on the edge of the coin to indicate its weight and fineness.